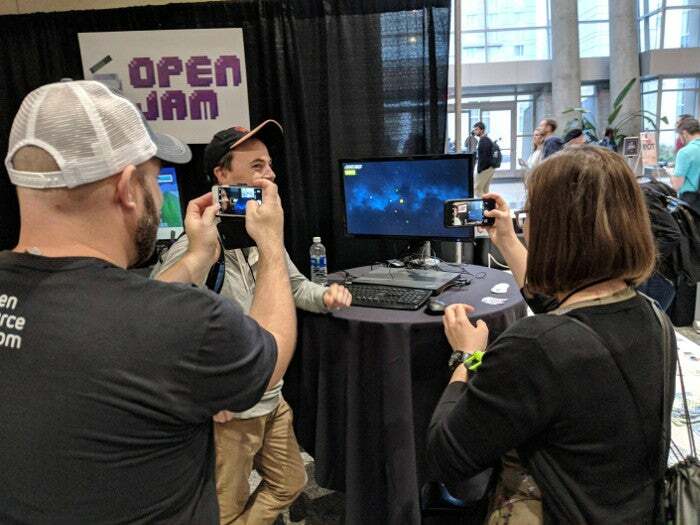 Check out the top three entries from the inaugural video game jam, which celebrates open source development. 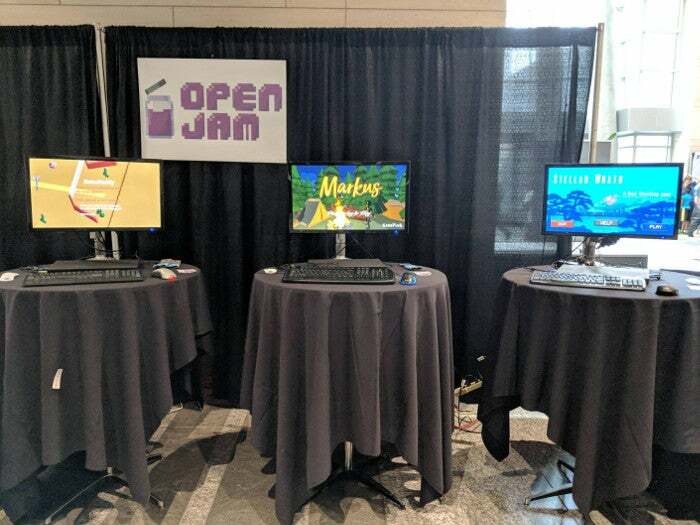 In early October 2017, the inaugural Open Jam, a video game jam focused on open source game development, took place. Creators were given 72 hours to build a video game from scratch using the best of the open source world. It was a fantastic weekend, with 45 games created and entered into the jam, and three outstanding entries making it to the final competition. Read on for a review of the event, lots of pictures, and heaping praise for the creators! The chat room was abuzz with anticipation on Thursday night, October 5, just before the jam started. When the clock ticked over to midnight, we announced the theme: Leave a mark. With theme in hand, the creators hit the gas and got to work brainstorming game ideas. Teams and solo coders from around the world settled in for a frenzied weekend of game creation. Any interpretations of the theme were welcome, whether literal, parody, or bypassing the theme altogether. The theme is a guiderail, an optional constraint to catalyze creativity. By Sunday night, the submission deadline was looming on the horizon. As it approached, games began rolling in, fresh from the creators' desks. All told, 45 games were created during Open Jam. Each one is open source and free to play. That wasn't the end of the party, though. The following week, October 9-15, creators played the games and rated them in a variety of categories such as humor, graphics, audio, and theme. The creators of the three best-rated games were rewarded by having their games featured at All Things Open 2017 on October 23 and 24. 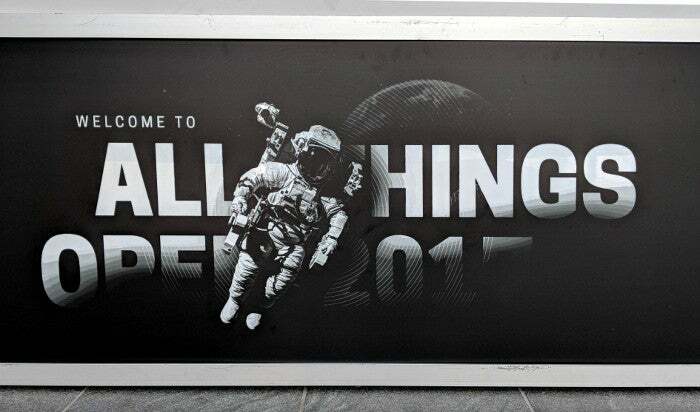 All Things Open (ATO) is a premier open source conference, held each year in Raleigh, North Carolina. This year marked the fifth ATO, and we were proud to be a part of it. Open Jam's location at All Things Open could hardly have been better; our booth was right behind the t-shirt and sticker exchange tables. 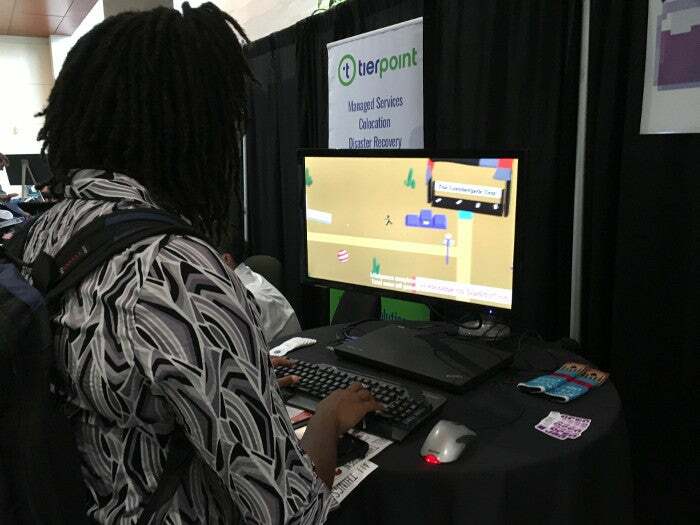 We set up demos of the three winning games at our booth so people could play them, learn about the tools used to create them, and compete for high scores. And now ... the top three games! Markus the Lost Magician is a beautifully designed and masterfully executed game. 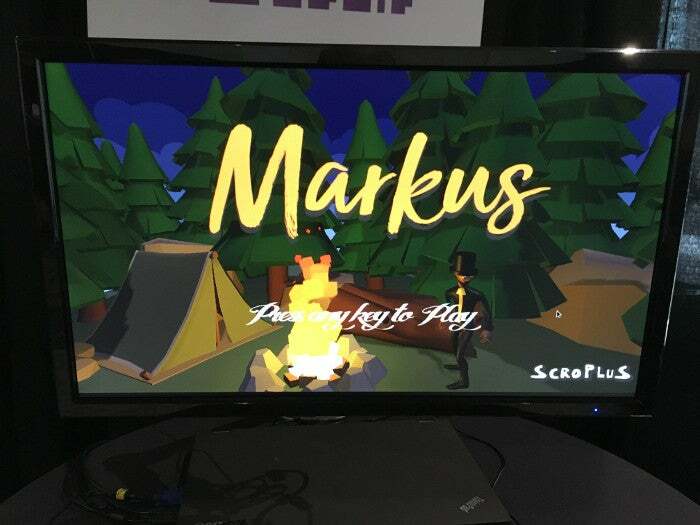 You control Markus as you make your way from his campsite through a challenging environment to arrive safely at his destination (no spoilers). The creators took the "leave a mark" theme to heart and bestowed upon Markus a magical power that allows him to bypass obstacles by drawing and walking on enchanted lines. The game presented a large but rewarding challenge to the players at All Things Open. Paul Chin Jr., cloud software engineer extraordinaire from Cloudreach, was the first to make it past the dreaded Wall of Spikes! The game is open source, of course, and the creators used Blender to create all the game's 3D models and animations. Markus the Lost Magician placed 1st in overall score and did extremely well in the other categories. It is the summer of 1984. You play as NervousDaddy, a timid father competing in a series of minigames. Enjoy the chill vaporwave music and old-timey voiceover as you shoot at trees, shoot at fish, and shoot at pong (???). Retro Daddy garnered a lot of laughs at All Things Open. The game's creator, @andrewhowizon used Blender to create all the game's 3D models and animations. Retro Daddy came in 2nd overall, and placed very well in the other categories, including 1st place in the coveted graphics and audio categories. Stellar Wrath is a game about solar system sabotage. You launch a spastic asteroid (AAAAAAAHHHHHH!!!) into a system of peacefully orbiting planets, with the aim of destroying as many as possible. It's a deceptively simple game with a surprising amount of depth and skill. The players at All Things Open had a lot of fun with Stellar Wrath. Something about planetary annihilation brings out the kid in everyone. The high-score holder, pictured below with his fans, is the head of a biology research lab. 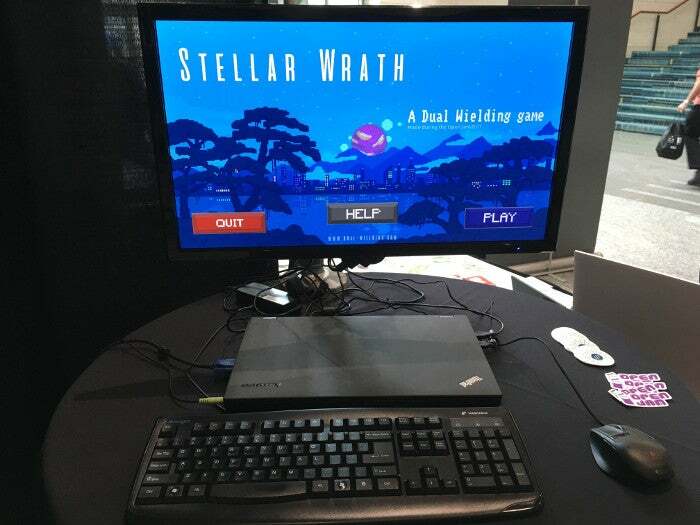 Stellar Wrath was created by DualWielding using the fantastic, open source Godot game engine. Coming in 3rd place, Stellar Wrath had good scores across the board. This was the first Open Jam, but discussions for a 2018 event are already underway. We're armed with excellent feedback from the game creators, so Open Jam 2 will be even better. Our mission of promoting open source tools and games continues, and we're considering several changes to that end. One tweak on the table is adding a new rating category—Open source karma—to reward creators for using open source tooling. Stay updated on Open Jam by following @fossjam and visiting openjam.io. 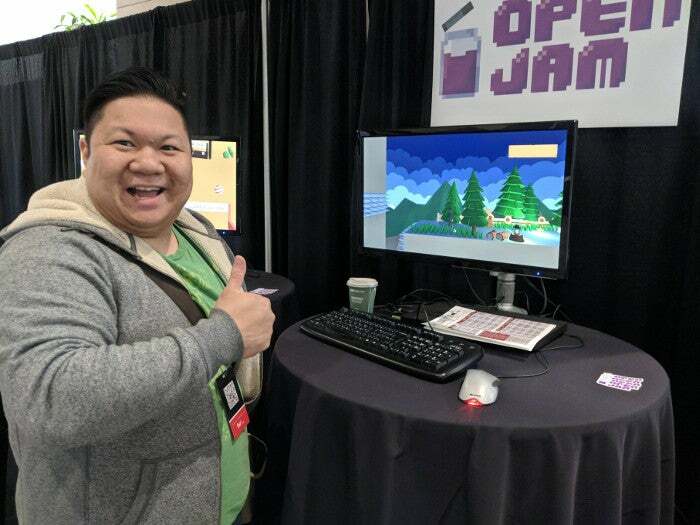 I attended All Things Open and stopped by the Open Jam booth. Loved the games, and was really impressed with how polished the games were - after just 72 hours. Wow! My favorites were Markus and Stellar Wrath. Markus was extremely clever. Stellar Wrath was just tons of fun.